Photo credit as labeled, thank you elley ! No words to describe him now....what else? That was a lovely thought. May I use it when I think of other amazing people ? it must be such a lovely and "clumsy" angel - they are many , you know who have got many gifts - and make our days brighter. your lovely imagination seems to be the perfect answer! Can't agree more! Thank you for a nice pic + writing! enjoyed reading much. Your closing words really made my heart stop...and resume again doing cartwheels !! Hi...thank you for liking my writing ! I don't write much...but I appreciate your comment. I also wonder what it's like...if only our picture can bring happiness to people...must be a blessing ! 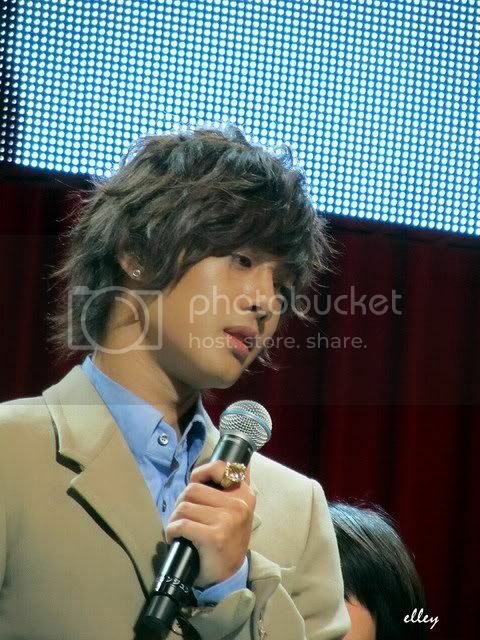 HyunJoong always brighten up my days when I'm not in the mood. Just staring at his pix, his smiles, his 4D, his laughing... will always cheers me up! Amazing....duno why. He just has this power to heal my sorrow! Lovely way to describe KHJ. You put everything about him very nicely in a nutshell. Many a times I think that I must be out of my mind to be so charmed by this young man in so many ways. May he continue to be truly blessed by the Angels! Great great great description of Leader Hyun Joong's attractiveness!!! He he me too...especially if I catch sight of Hyun Joong's face in unexpected places...I just BURST into a smile....now, not many people can do that !! May the Angels watch over him !